One advantage of reading a newspaper in print is the chance you’ll stumble into something good you never would have searched for online. Like Tom Farragher’s first-house piece in the Boston Globe’s revamped Sunday real estate section. Telling the story of the Connecticut house where he and his wife, Joanie, learned to be husband and wife, Tom got me thinking about Beacon Hill Friends House and what it’s teaching me. In neither case is it just about the house. The co-conspirators in Tom’s story include his smart wife, his crotchety neighbor, his carousing co-workers at The Day paper and a couple of elderly brothers running the local hardware store. The co-stars at BHFH? Let’s start with my smart wife and my brave fellow housies. Plus the house itself, a couple of massive five-floor brownstones mushed together on each floor by doors leading to hallways and rooms that slope up and down like so many billowing fairways and greens. It was Carol who got us here, thanks to a tip from our friend, Margaret Benefiel. Margaret chairs the Quaker board that oversees this “intentional community” of 21 people. 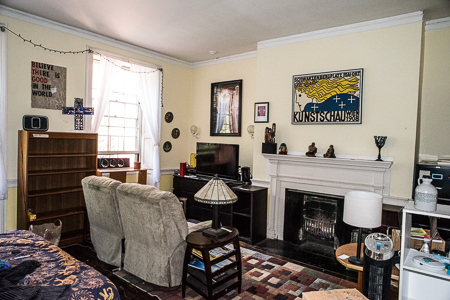 Although the Beacon Hill Friends Meeting (a separate group from the house itself) rents the house meeting room for worship on Sundays, fewer than half of the house’s residents are Quaker. Other affiliations include Jewish, Catholic, Pagan and various points along the scale of belief and unbelief. The house is run on Quaker principles, though, as well as a detailed list of rules, guidelines and expectations. Getting in wasn’t easy. The application process reminded me of seeking college acceptance except that the questions were more personal and demanding than any dreamed up by the Notre Dame admissions staff. Among them (I’m paraphrasing here): Is Bill the sort of person who has to be reminded to do his chores? Julie Moos and Marton Balla managed to respond creatively and accurately enough in their reference letters to get us in. Two flights up from the kitchen is the library, a high-ceilinged haven that runs the length of the house. Several of us who work mostly from home spend a fair amount of time there during the day. It’s also where all 21 of us gather twice a month for mandatory two-hour meetings. Thanks partly to the blunt Quaker tradition encouraging concise and focused conversation, some of our house meetings rank among the most interesting — and least burdensome — meetings I’ve ever attended. I especially appreciate the “talking rock” part of the meeting. With a timer limiting each comment to two minutes, housies offer a glimpse of what’s up with their lives before passing the rock to the next person. As much as I consider myself a fairly open person, my level of sharing falls far short of much of what is revealed by others. Initially, I was thinking TMI. Lately, I’ve been seeing the longer term benefits of getting to know people more intimately. You’ve probably heard the old admonition to avoid comparing your own insides to other people’s outsides. After talking rock at BHFH, we find ourselves in the unusual position of seeing one another’s insides, too. Nothing like actually knowing what’s going on in someone’s life to erode the comfort of quick judgments and unsupported conclusions. We’re not entirely sure how long we’ll end up living at BHFH. Residents are admitted for two years with the possibility of two extensions of a year each — meaning an overall limit of a four-year stay. As we approach the end of our first year, the experience is feeling more and more like a Gap Year — an opportunity to step back from life as we’ve known it and try on some new paths forward. Since our time in the house comes at a point when we’re fairly far along in our marriage (44 years this month), it’s unlikely we’ll look back on it as the place where we learned, as the Farraghers did, “to be husband and wife.” I have a more limited aspiration: becoming stewards of our space. Despite all the downsizing we’ve described here and here, we know we’ve crammed too much stuff into our 16 by 18 foot room. We know we’d enjoy life more with less. We bet the house will teach us how. What is your home teaching you? 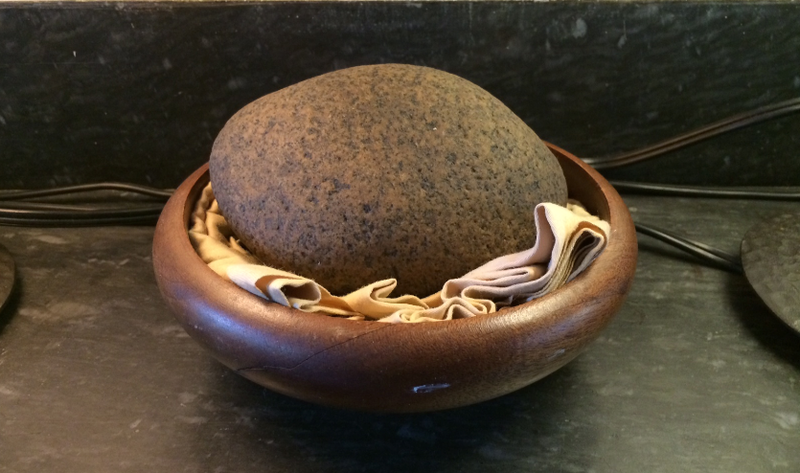 This entry was posted in Aging, Chores, Community, Diversity and tagged Posted by Bill Mitchell, Talking Rock. Bookmark the permalink.